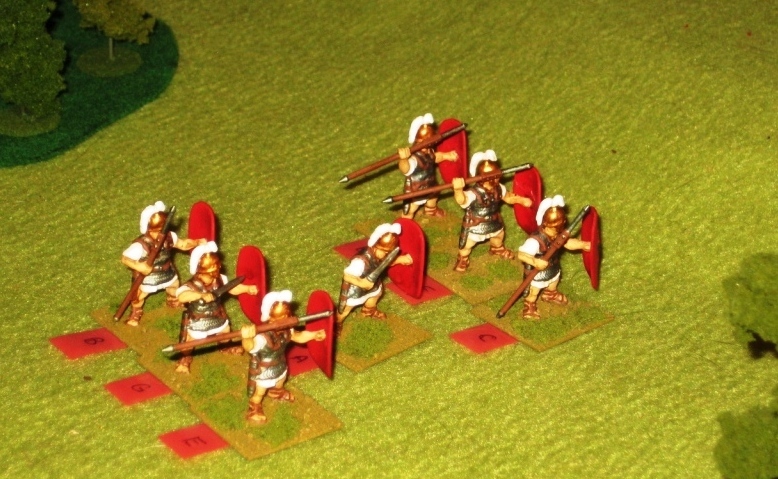 I was looking for a set of skirmish rules to use for smaller sized skirmish games between Romans and Ancient Germans. After reading through a lot of reviews on the Internet, I opted to buy and try Advanced Song of Blades and Heroes. Being a bit optimistic about these rules, I also purchased the horror version (Fear and Faith) to use for zombie games and the French and Indian War version (Song of Drums and Tomahawks) as they just looked interesting. 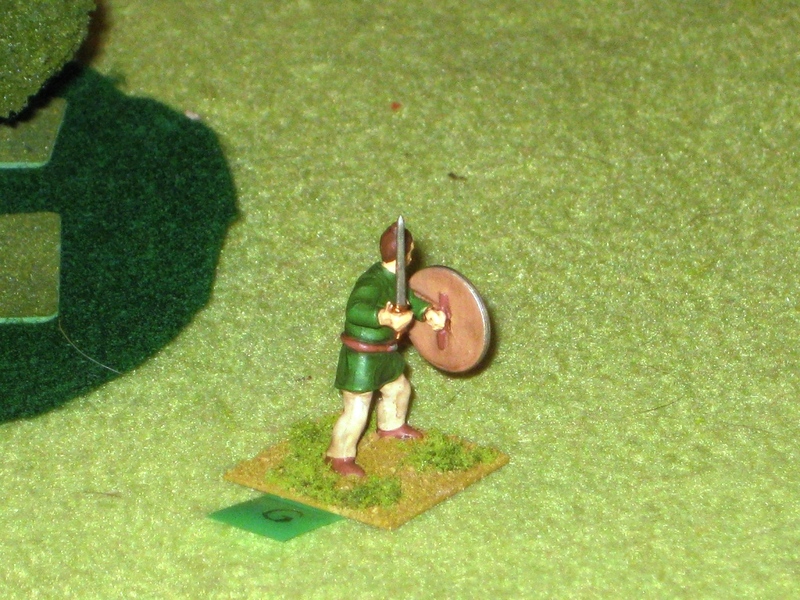 I have only had the opportunity to play the Advanced Song of Blades and Heroes set of rules. Overall, I really liked them. The two key things I liked are the activation system, which makes activating every figure a real decision point in the game, and the traits as they allow you to individualize each figure beyond their basic quality and combat ratings. In activating each figure (or group if activated by a figure with the leader trait), you can roll 1, 2 or 3 dice.Each that is equal to or higher than the figures quality rating allows that figure to carry out 1 action (a few actions take 2 activation points). 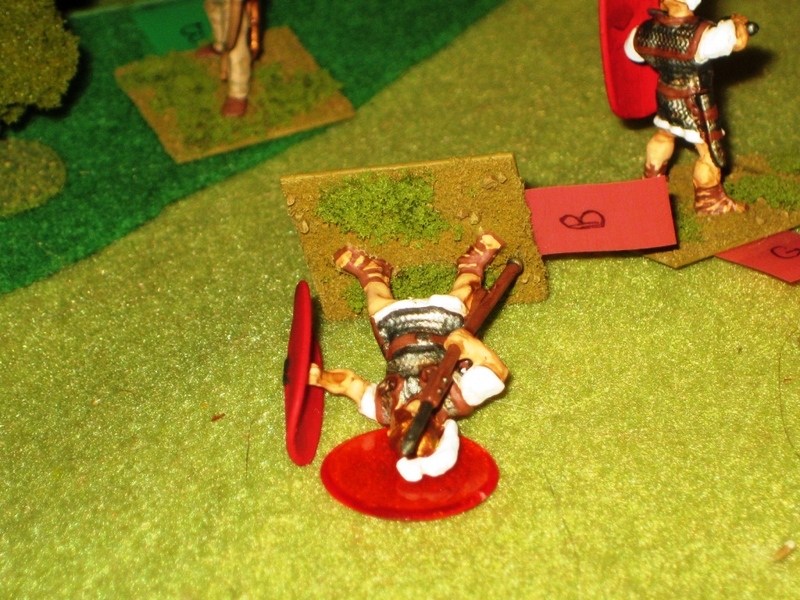 The problem is that if you fail a roll, the other player/side can use that action as sort of an opportunity action (they do have to roll to active a figure), which might allow them to fire at your figure, melee one, or move. If a figure fails two activation rolls, then the other side can either take those two actions as an opportunity action or end the other players turn. A very simple system, but it works very well. Likewise the traits allow you to characterize your figures in a large variety of ways, so they are not just one-dimensional figures with one or two traits. Also there is a point system so you can have fairly equal forces on both sides if you want that. I played part of one game, then realized I had screwed some parts of the rules up. I reread those parts of the rules and tried again. 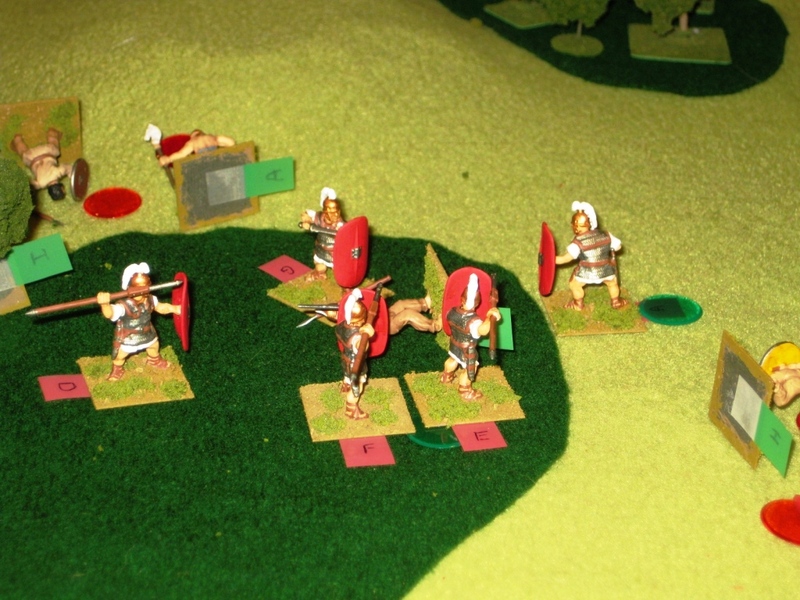 I found these rules provided a very good skirmish game for ancient era combat. I tried to have fairly equal points (around 400 if I remember correctly). That worked out to 7 Romans vs. 11 Germans. I found these two forces to be fairly equal in ability. 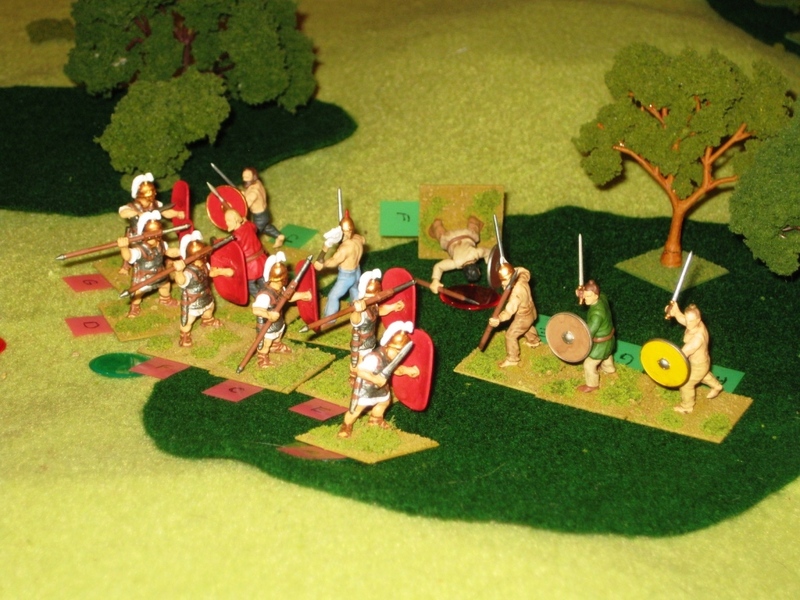 The combat system, which is often inconclusive as well as the morale rules made sure that the game was not just a one round annihilation of one side like in some other skirmish rules. I can’t remember how many turns I played, but it seemed like there were plenty before the game was clearly over and the last German ran off. 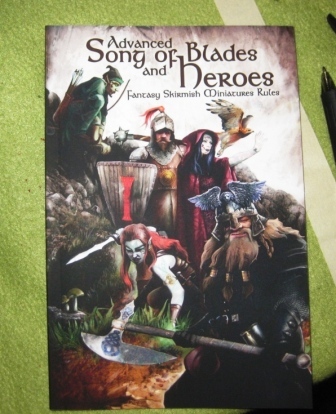 All in all, Advanced Song of Blades and Heroes is the sort of rules I was looking for. It worked well, was easy to learn, and was interesting to play. Now that my son’s high school band program is largely finished for the semester, I hope we can find the time to give them a try so that we have a real 2 player game. 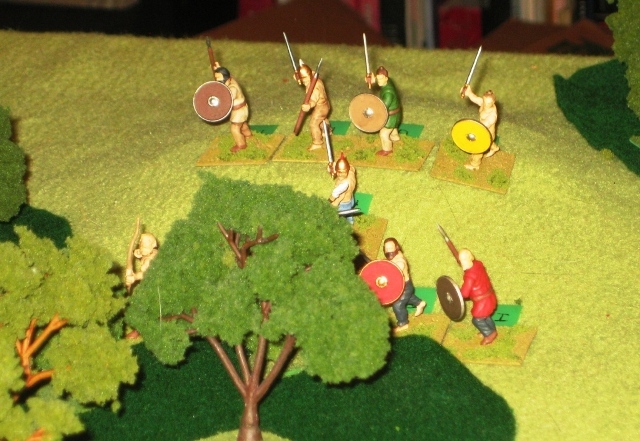 All in all a success in terms of finding rules to use for this period and with the size of battle I was looking for. You are currently browsing the archives for the Advanced Song of Blades and Heroes category.